party perfect: HIcks Paper Goods GIVEAWAY #3 + DISCOUNT! HIcks Paper Goods GIVEAWAY #3 + DISCOUNT! Our last giveaway is a doozy- a set of 50 Hicks photo cards (holiday or other) will go to the lucky winner! With a $142 retail value and the option to upgrade the winner's order at half off, this is quite a prize. View the photo card collection right here. You can either tell us about an item you'd like to see in the Hicks collection that doesn't currently exist, or tell us your favorite design in the comments section. LASTLY- for those who simply just love a good discount, you won't want to pass up this deal Lemon Tree Paperie is offering to Party Perfect readers for a limited time. 15% off all Hicks Paper Goods orders (that's on anything and everything we offer- 1400 items!). Just enter HPG15 at checkout. All of the cards are gorgeous! I especially love the outlined dot in pink/green, and would really love it in red or burgundy with the green for the holidays. I have an old picture of me as a very small child sitting amongst the Christmas lights while my dad was getting ready to put them on the tree, and I would love to do a remake of it for our card with my baby girl, and I think it would look perfect on that card! Love the red scallop ribbon , but there are really too many cute ones to choose. Any card with a brown frame really appeals to me. Would love to do our christmas card with browns and reds. So many awesome cards, but I am loving birds!! Cardinal on a branch is my favorite! I would love to use it as my card this year! I like the vine green flat photo cards! i love the pink chevron photo card! i could easily use this for our xmas card and know my f&f would keep it on the fridge well into february since it doesnt scream "the holidays". Oh I really, really would love these! I'd like to see something with a rick-rac look to it, if that makes sense? Thanks for the chance to win! so many cute cards! love the festive antlers! Love them all, but the double dear (deer) one is so cute. What I thought might be a cute idea is incorporating the 12 days of christmas into cards. Partridge in a pear tree christmas photocard. Or even the nutcracker but of course putting your own touch to it. Just a thought, keep up the great designs! love the half moon blue/brown design! They were all such lovely designs and it was tough picking a favorite but if I have a chance I will pick the Cardinal On A Branch Photo Cards. I like the trellis green and urban floral invites but really, I love it all. The Diamond Red card is just lovely! I have a soft spot for the pig BBQ card (not sure if this is still in the line). We used it as a day-after-wedding BBQ invite! I adore the holiday stocking photo card! Me and my husband have one little dumpling so that card would be perfect for our little family! Thank you for hosting such a generous giveaway! I am a new follower and cannot wait to keep coming back!! So nice to meet ya! The Ivory Deer Antlers card is darling! We have an interfaith family, so it could work for any winter holiday (or even a new year's card). Thanks for letting us participate in these fun giveaways! i love the snowflake stripe photo cards, but they're all gorgeous! Amazing holiday line. I loved all the round address stickers, especially the green and red scalloped edge one and the candy cane one. I was so taken by the stickers that I had to go back and look at all the cards. What a fabulous line!!! wow- beautiful! What a generous giveaway! And the perfect time too! So many cute cards to choose from!! I would have to say one of my favorites is the "Cardinal on a Branch". I love all your cards, especially any with an aqua and red colour scheme. My fav Christmas designs are red aqua and pink. I have had my eye on the "A bird & Holly wreath" cards since this summer! After checking out all the products, I also LOVE the return address labels with the same design. Winner or not, this year we will certainly be taking our Christmas cards up a level this year with one of your designs. I'm so glad I found your site! I just love them all!! I really love the blue stars flat photo card!! omg, I loooove the Double Deer Antlers card -- I immediately envisioned our two dogs poking their heads out under each of the antlers! My fiance and I are getting married in November, and this card would be PERFECT for our first "family" Christmas card mailing!!! their ladybug leaf design is too cute! thanks! I like the diamond red photo card. That one looks awesome with a black and white photo! Doesn't matter color, shape, or size. I know the joy of getting a card and I think there is even more joy when getting them. I always save the holiday cards especially the Hicks ones I recieve! I know it's meant for kids, but I'm enough of a space afficianado that the rocket invitation is incredibly tempting. So much fun! I love the Christmas Tree photo card! Oooh I love them all! My favorite is probably Peace Red. I love it! well, if i HAD to pick a favorite, it would be the diamond brown photo cards. SO NICE! So so cute! I like the cardinal on a branch and bird on a snowy branch holiday cards. I've never heard of Hicks before now and I love all that they have to offer. The designs are so fresh and fun! Thanks for the chance to win such fabulous prizes!! wow gorgeous cards, i love them all! i do love the diamond green or red cards...hope i win!! VERY much so! Can't pick just one but the festive antlers are adorable! love the cardinal on a branch. That color combo is one of my faves. Cant wait to hear about the baby! I love them all! Congrats on your growing family! The minute I clicked on the page, I saw my favorite and looked no further. I LOVE cardinals... so cardinal on a branch it is! I can't think of anything that's missing-- you have so many amazing designs! The red scallop ribbon would be awesome for the holidays. I really like the style of these cards! So I'm a single girl that enjoys moving announcements, Christmas cards, etc. I would enjoy seeing something that looks more single girl like. Classy but not quite so family-oriented. I'd love to see something like the red coral but in shades of grey, black, and silver. I wish there were photo cards that featured more of the photo and then had the design and writing on the side. I know there are a few that are designed like this, but I wish there were more options to choose from. Basically, I love having a big photo and a pinch of cute design on the side.... With that being said, I love all of your cards and would have a hard time picking just one! Love the one edged in green with the red stripe in the middle! Wow, this is great! I love cardinal on a branch...this giveaway has put me in the holiday spirit! Oh goodness! I LOVE the deer antlers. How fantastic! i really can't decide! such unique designs. i think i like the half moon and chevron designs the best. hope i win! I love the Cardinal on a Branch photo card. So simple and chic! This is such an easy one... what I like most are the shipping labels and the calling cards. Both are lovely! talk about paper heaven!! i adore the "Candy Cane Stripe Photo Cards", would love to see more designs chic graphic prints but in holiday colors.. or maybe a green & red polka dot pattern could be great. thanks! Love these cards! I would have to go with either the full moon red or the merry merry card. It all depends on the picture I'd choose . . . family or cute little girl! Red scallop or reindeer family -- it's a toss-up! Too cute! The love note cards get my vote! There's something about birds and Christmas that fit very well. Thanks for sharing your collection with us. I LOVE the "Twice as Nice" twins birth announcement. It'd be perfect for my boys. This mom of twins doesn't have time to make her own! Tough call, but I think I like the initial wreath one. Love the blue/snowflakes, too! The Diamond red cards are my favorite and I LOVE all the return address labels! Too many to choose! But, I narrowed it down to initial wreaths photo card or candy canes photo card. I love the Christmas tree photocard. Adorable. I love all the children party invites. They are whimsical and still modern. This is too hard!!! I can't decide..... Okay - here are my favorites: Aqua Avery, Berry Branches, Bird on a Snowy Branch, Cranberry Punch, Hip Ornament, Moorish Blue, Quad Present, Santa Stripe, and really the rest of them! I would be proud to mail any of those as my christmas card this year!!! Love all the cards! Especially the hot pink and lime green! Thanks for the chance to win! I just adore the stitch red invitations! So holiday cherry while simply enough for anyone. I love the lots O dots design!!!! and the big flower design and anything with the snowflake design!!!! wonderful site!!! I really love all of your designs. I love the bird one, and that made me think that a design with an owl would be nice. Thanks for all the giveaway chances! I love the double deer antlers card, too cute. All the cards are great it was really hard, but I could just picture my boys, faces on that card. They are all gorgeous! Right now I am loving the one with the cool graphic backgrounds. They remind me of a the Imperial Trellis pattern by Kelly Wearstler that I love so much. 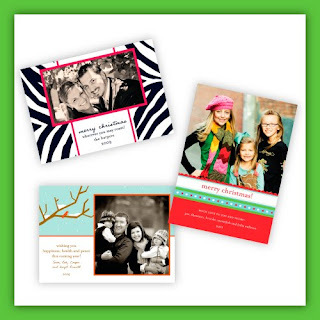 I love the Banner Happy Holidays Flat Cards they would make perfect holiday invites, so cute!!! Thanks!! i'm in love with the modern designs of all the cards. the 'bird in a tree' cards are my favorite design! although i'd have to hold off in ordering those cards because i dont have any kids yet! i'd love to do christmas cards with the houndstooth design! How do I choose just one? I really like the red scalloped ribbon photo card. I love all of them! These are the best cards I've seen! It's hard to chose a favorite, but I really like the green diamond because I'm so into green right now and the pattern is so classy. But I also LOVE the deer antlers one because my baby's face would be so cute on it! I love the BELIEVE card. Such a sweet, simple statement, and would be beautiful with a black and white image of my little munchkins this year! It is very hard to pick my favorite, but I really love the Quad Present Photo Card! It is the perfect way to send a little of our family to our friends and family that we don't get to for the holidays! I love Cardinal on a Branch, such a cute holiday design, but honestly they're all darling. I would love to win! The Peace Red Photo Card is my favorite! So retro looking. So many beautiful designs. I would love to see a monthly desk calendar added to the collection. There are too many faves to list here ... thanks for the great designs! I love the Cozy Kitchen invitation! i adore the cardinal on a branch! they'd make perfect holiday cards for our little family!!! fingers crossed!!!! I love the candy cane photo card...Congrats on the new baby! Simply G O R G E O U S! With our new little bundle due in 3 weeks, this would be the best gift in the world. My favorites are the Reindeer Merry Card & Bird Couple Baby announcements. Fingers crossed! green sheep. lots of cute choices though. Great cards--I especially like the dot ornament card and the diamond collection. I love them all... beautiful! They are all fab but i love the red diamond card the best. Too cute. I love the Festive Antlers Photo Cards! Too cute! those snowflake cards are cute! LOVE your blog!! I really love the cardinal wreath photo cards, they would be perfect for our Christmas cards! I would love to be able to use TWO letters in the return labels - my husband and i have kept our last names and our kids are BOTH. So much eye candy, so hard to choose just one! The colors are all gorgeous, but I'm partial to the cards with the birds on them. They make me smile! Congratulations on your new baby girl! I've missed your blog and have been anxiously awaiting the announcement! I love the antler cards, but it was so hard to choose one. I like the Berry Branches photo card. love the brown chain card- all of them are pretty spectacular!